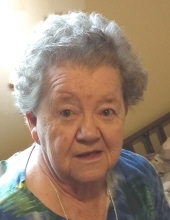 Rita Luella (Sharon) Gebo of Great Falls, Montana was 80 years old when she passed away on Sunday, February 3, 2019 at 5:55 pm in Great Falls from Parkinson’s Disease. Services for Rita will be held on Saturday, February 9 at 10:00 a.m. at Hillcrest Lawn Memorial Chapel (1410 13th St South Great Falls, MT). Rita was born on April 15, 1938 in Great Falls, Montana to Henry Sharon and Hazel (Sharon) Becker. She started grade school at S.D. Largent School. Rita continued her education and graduated from Great Falls High in 1957. As a child, Rita’s family lived on the southern outskirts of Great Falls in an area that was locally known as “Sand Hills.” She was quite fond of telling stories about growing up and having so much fun with her friends Judy, Tootsie, Sherrie, and Lois. Rita loved the fact that her and her friends were able to play together for endless hours with almost no toys and using lots of their own imagination. While raising four kids and running a household, Rita also had several careers. Everyone knows about Avon, but she also sold for Fuller Brush Company. Often, Rita would say that working in the pet department at Torbert’s in Kalispell was one of her favorite jobs. Rita also worked as a receptionist, setting box ads and proof reading copy for the Seattle Intelligencer newspaper. In California, she was an administrative assistant at Vocational Rehabilitation in Van Nuys. After returning to Montana, Rita started employment at Montana State School For the Deaf and Blind. Her first job there was as an interpreter and later became a teacher’s aide. After retirement, Rita volunteered for “The History Museum” of Great Falls. She found this to be a true labor of love. Rita often would contemplate returning to her volunteer work at the museum until the time of her death. Rita was married in 1957, to the love of her life, Richard “Pete” Gebo. They celebrated 48 years together before Pete’s passing in 2005. As a couple, Rita and Pete spent many hours working together on their hobbies. Rita created gorgeous ceramic pieces while Pete created stunning pieces of stained glass. Rita and Pete also sponsored several senior classes at Montana State School For the Deaf and Blind. As class sponsors, they supported the students in the pursuit of earning money for their senior trip. Rita and Pete’s brainstorming idea for earning money was to have students sell tickets to International Dinners. For these dinners, the students were each responsible for helping with every step in the process which included the development of menus and all the steps of cooking and serving the international meals to ticketed guests and the cleanup. The students were cute as buttons as they dressed up in their black tie wardrobes. Family time was often spent on camping trips or playing games. Ragball and Aggravation were the two family favorites. In later years, the card game Texas Hold’em was added to the favorites. The family championship tournament was won by Rita. If you spent any time with the Gebos, you learned to play ragball. When you played ragball you were hooked within the first pitch. The game could not be played without the expert seamstress (Rita) making the balls. Rita’s ceramics were coveted treasures that were often received as gifts to her children, grandchildren, and friends. Of her plethora of ceramic creations many were ribbon winners at the state fair. The ribbon always accompanied the gifting of the piece. Several of her created steins were state fair winners. All of her ceramic pieces were elaborately detailed and meticulously painted. Another talent Rita had was sewing her own clothes using Simplicity patterns. Rita’s additional hobbies included many mediums of art such as drawing and painting. Gardening was more than just a hobby. She spent hours and hours planting flowers for the yard’s landscape. She used all kinds of decorations besides plants and flowers to create her oasis. Rocks were hauled in by the truckloads. After Rita picked out the rocks, they were gathered by her sons and hauled back to Rita’s house. Each year, the boys would take Rita to the mountains around Augusta on her birthday and Mother’s Day returning with loads of rocks that would stress the toughest of trucks! Among the rocks and flowers was old machinery. Rita also used her ceramic pieces to enrich the beauty of the yard. One of her favorite settings in the backyard was the complete set of Dwarfs accompanied by Snow White. The set even included a mine shaft and ore carts. Also, known for being feisty, courageous, and stubborn, Rita could sometimes be heard speaking her mind loud enough that even her deaf husband, Pete may have been able to hear her roar! These were traits that helped her through many of the courageous events in her life. An example of this is when she went traipsing across the United States from Great Falls, Montana to McGuire AFB, New Jersey by train. This trek also included flying across the Atlantic to Iceland. Oh, and by the way, she had four young children all under the age of 7 accompanying her. Talk about "A Tuff Nut"!!! Some of our fondest of memories of Rita involved her cooking. There were many occasions which Rita created special breakfasts for the grandkids, like love filled pancakes with a few chocolate chips thrown in for good measure. This was just the tip of the iceberg some of her famous creations included, puddings, pies, apple strudel, and of course her famous lemon bars which Rita always brought to Riddle’s Jewelry for Christmas treats for all the employees, especially Jerry Hagen! If main courses were more to your liking you might see Swedish meatballs, scalloped potatoes with ham, Hunts burgers, Hungarian goulash and German spaetzli served up. Rita made delicious soups, from the traditional split pea or French soup to self-created soups such as hamburger soup and the always yummy but questionable “Freezer” soup. This soup was created with any left overs found in the refrigerator freezer. Rita was very generous with her soup. Over the years, she cooked many gallons of soup for her family and friends. Rita is survived by sisters, May Lattin and Diane Leiker; children Gary (Phyllis) Gebo, Perlene (Rick – deceased) Lake, Pete Gebo and Keith (Lisa) Gebo; grandchildren Joset (Scott) Hansen, Ronda (Chad) Gierke, Brian (Crystal) Gebo, Matt (Mindy) Gebo, Marti Gebo, Adrianne (Odie) Weaselhead and numerous great-grandchildren and great-great-grandchildren. Rita was preceded in death by her parents, Henry Sharon and Hazel (Sharon) Becker; husband Richard “Pete” Gebo; and sisters Sherrie Bier and Peggy Yearout. To plant a tree in memory of Rita Gebo, please visit our Tribute Store. "Email Address" would like to share the life celebration of Rita Gebo. Click on the "link" to go to share a favorite memory or leave a condolence message for the family.